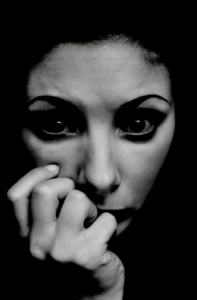 Having an anxiety disorder is an unpleasant state of inner turmoil, It is generally felt as unpleasant feelings of dread. Anxiety is not the same as fear, anxiety is the expectation of future fear and can be a feeling of uneasiness and worry. It is often accompanied by muscular tension or pain, restlessness, fatigue, problems with concentration, or facing a difficult situation without the required skills. Some symptoms may include changes in sleeping patterns, changes in habits, increase or decrease in food intake, and tension causing continual movement (such as foot tapping). Other anxiety symptoms may include “feelings of apprehension or dread, feeling tense or jumpy, anticipating the worst, irritability, restlessness, watching (and waiting) for signs (and occurrences) of danger, and, feeling like your mind’s gone blank as well as/bad dreams, obsessions about sensations, a trapped in your mind feeling, and feeling like everything is scary. The cognitive effects of anxiety may include thoughts about suspected dangers, such as fear of dying. “You may fear that the chest pains are a deadly heart attack or that the shooting pains in your head are the result of a tumour or an aneurysm. You feel an intense fear when you think of dying, or you may think of it more often than normal, or can’t get it out of your mind. The list of problems associated with an anxiety disorder seem endless, different thoughts affect differnt people, but they are all caused by your own negative thoughts. If left, anxiety can go on to cause physical symptoms and can amplify thoughts into other more severe mental health illnesses. Now, this next sentence sounds too simple, but all negative emotions can be removed with Rone™ Therapy, and if all your anxieties are not removed in one session, there is no charge. The longest journey starts with the first step, but this is a short journey….